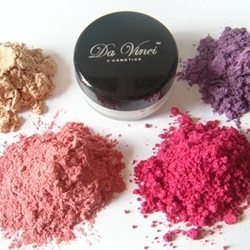 Da Vinci Cosmetics Mineral Shimmer Powders 101 colors ideal for you. Da Vinci Powder are versatile, can be apply 11 ways from; Eye-shadow matte, Eye Shadow Shimmery, Eye Shadow metallic, Eye-liner, Mascara, Lip Gloss, Blush, Body Bronze, Temporary Hair Highlight and Body Art. Makeup artist love our multi shadows since they can be create amazing eyeshadow look. Cruelty free cosmetics line.